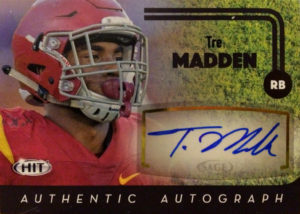 So when Nathan and I were dealing autographs in the parking lot at my work, I made the shrewd acquisition of Tre Madden. I mean- it probably won’t payoff, but I was already aware of his deep NFL and athletic bloodlines, so picking him up appealed to me. After initially starting his football career at USC as a linebacker, the Trojans decided it’d be best if Tre moved to runningback in 2012. Injuries completely railroaded his year at USC, so he doubled down for 2013. He put together a respectable year, contributing 703 yards rushing on 138 carries, and 201 yards and 4 TDs on 15 receptions. After injury struck again in 2014, Madden returned for 2015 and had 85 carries for 452 yards and 5 TDs. He also caught 17 passes for 133 yards and a TD. Tre went undrafted in 2016- flagged due to his injury riddled history. He later signed with the Seattle Seahawks and got a lot of work at fullback for the franchise. An injury ended his 2016 before it began. After clearing waivers, the Seahawks placed Madden on injured reserve to get a better look at him for 2017.